Sweet baby courgettes are delicate beasts, so they won’t overpower the soothing slices of buffalo mozzarella. Buffalo really is better than cow in this case, because the texture is so deliciously yielding. Warm 2 tbsp olive oil in a large frying pan over a medium heat. Add the courgettes and fry until golden. Drain on kitchen paper. Wipe out the pan, return to the heat and add the remaining olive oil, the garlic and the capers. Cook for no more than 1 minute (if the garlic burns, it tastes bitter). Remove the pan from the heat and add the red wine vinegar and about 10 torn mint leaves to the pan with 2 tsp water and a grind of black pepper. 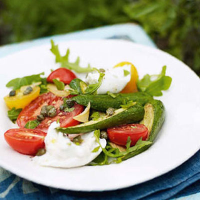 To serve, divide the courgettes, mozzarella slices, tomatoes, rocket and the remaining mint leaves between four plates and spoon the dressing over.